I’ve been podcasting since 2010 and have produced well over 750 episodes of various different shows. My Yes Music Podcast began in 2011 and earned a top rating in the ‘Personality’ section of the European Podcast Awards in 2012. I have been privileged to interview many band members and other well-known personalities associated with the band and have reported live from events including the 50th Anniversary Fan Convention in London and the unveiling of the official plaque honouring the band’s formation in 1968. The Pivotal Podcast, which I have hosted and produced for Pivotal Education since 2013, was voted into the top five of the worldwide Edublog Awards ‘Best Educational Use of Media’ category in 2015. 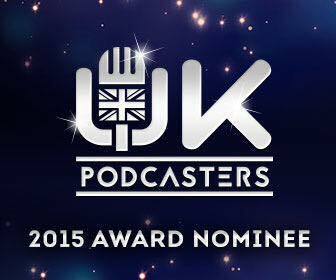 It was also a finalist in the 2015 UK Podcasters Awards and number 1 in its iTunes category in 2016-2018. The Sue Atkins Parenting Show is free, weekly show from TV and radio parenting expert, Sue Atkins. Parenting can be a frustrating, overwhelming and challenging business but it can also be a huge joy, privilege and source of inspiration. Sue’s vision is to inspire millions, one parent at a time building confidence, positivity and harmony within families, enhancing and fine tuning, not judging, criticising or blaming. The Jane and Bea Show provides honest insights into the why, what and how of raising children without your own baggage tripping you up. Jane and Bea share their personal and professional learning, experiences, and practical solutions. Tune in for a good dose of humour, tea and reality! The relationships created with global audiences who listen every week to the shows have resulted in many hundreds of powerful connections. Podcasting is an intimate medium where connection and community enhance the reputation of the hosts. Podcasting had led to many amazing experiences for me and I can help you to achieve the same! On Episode 2 of the Jane and Bea Show, Bea reflects on how amazing it is when other adults are able to adapt and respond to our child’s specific needs. There is also a discussion and exploration of the common parenting tools of bribery, incentives and rewards, inspired by Jane’s live debate on ITV’s This Morning show. A common rule of thumb in podcast editing is that it follows a 4:1 ratio – it takes 4 mins to produce 1 min of audio. That’s why you will find editors who charge by the hour. I prefer to charge ‘per completed episode’ so you know what you will be making a commitment to. It’s difficult to give definitive figures as each project is different and so I like to have a conversation with you before we begin and review the costs as we go. If you’d like to have a chat about what I can offer, please let me know via the contact page.